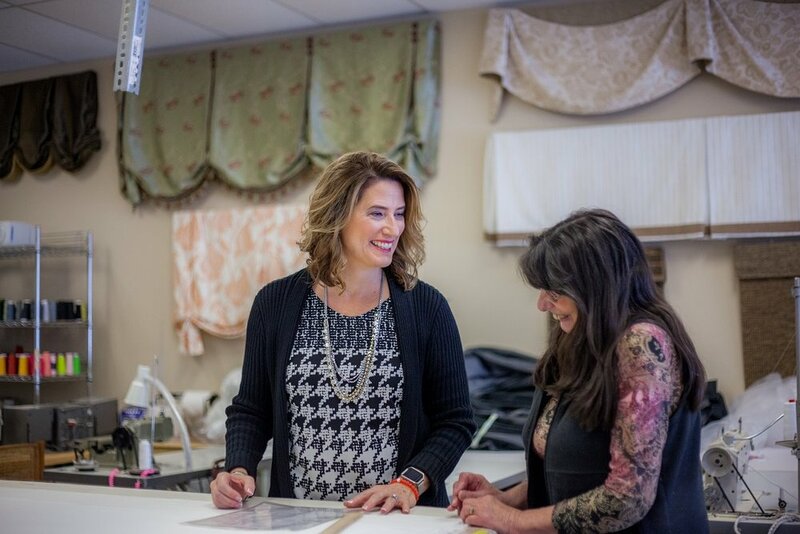 In 2008, Stacie Kennedy created her home-based, full service custom window treatment design and fabrication business serving the Metro Atlanta area and beyond. She is a former Commercial Real Estate Paralegal, who has always had a passion for design. Having learned how to sew from her mother as a teenager, Stacie took her sewing skills to the next level by opening her own creative design business. She has worked with or for several other design operations, including Atlanta Custom Interiors, to help maximize her industry knowledge, all while serving as President of the Atlanta chapter of the Window Covering Association of America. Stacie also attended the Custom Home Furnishings Academy (CHF) in Charlotte, NC, where she received her certification as a Career Professional in Custom Window Treatments and Workroom Techniques (CPC). In 2010, Stacie received awards at IWCE – Vision for First Place in Curtains & Draperies Workroom and also CHF Alumni Showcase and has been published in both Vision Magazine and Drapery & Design Professional Magazine. More recently, in May 2017, Stacie was also published in Vinings Lifestyle Magazine, highlighting women entrepreneurs in Smyrna-Vinings, GA. Starting in September 2012, Stacie began offering an after school sewing program at Whitefield Academy for third and fourth grade students. The faculty, parents and students involved have been very supportive and the program has been a huge success and will continue to be offered in 2017 in the original afterschool structure as well as semester breaks and in summer camps. Relying on a creative vision enhanced by her specialized industry skills, Stacie can take your ideas and plans and create a customized reality for your home, office or restaurant/retail business. She is currently a WFCP Member, Window Coverings Association of America (WCAA) National Member, WCAA Atlanta Chapter Member and serves as Co-Chair of Publicity for WCAA Atlanta Chapter and has served in various board positions of the WCAA Atlanta Chapter, such as Secretary, Vice President and President.